Richard E. Peltier receives funding from the Environmental Protection Agency and the Commonwealth of Massachusetts. Anyone who has stepped off an airplane in one of the major cities of the developing world has encountered profound and noxious air pollution. In New Delhi, Jakarta, Accra, Kathmandu and many other cities, diesel exhaust and burning garbage foul the air. 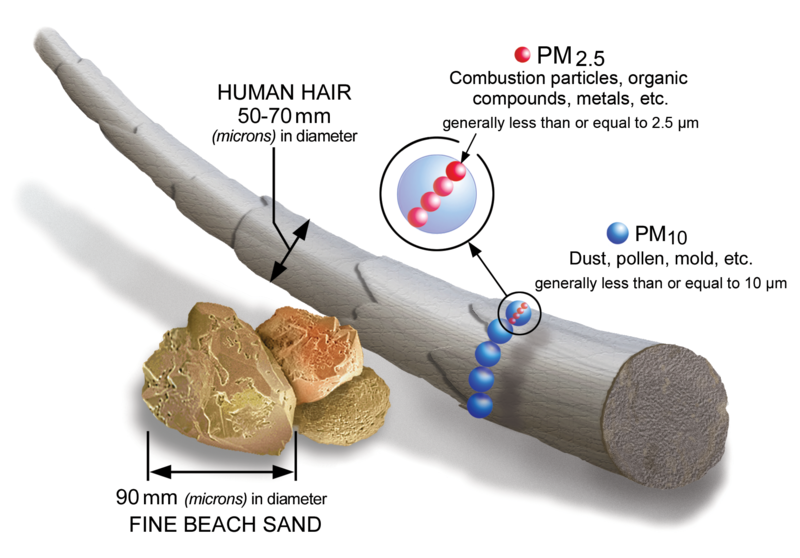 The most serious concern is particulate matter (PM) – microscopic particles, much smaller than a human hair, usually produced when chemicals from fuel combustion react in the atmosphere. Once these particles form, winds can transport them over long distances. Exposure to particulate matter causes nearly six million premature deaths every year. Most of these deaths occur when PM exposure causes heart attacks, strokes or lung disease, so many people do not realize that air pollution is the underlying cause. As a result, many people view air pollution as a quality of life issue, not as a global health concern. At my laboratory we study how air pollution affects public health. We recently analyzed how effectively several types of face masks – including versions widely used in heavily polluted cities – protect users from hazardous levels of PM. Our results showed that no mask is 100 percent effective, and the cheap cloth masks that many people in developing nations use sometimes provide very little protection. These findings highlight the need to reduce air pollution in communities, and to provide better protection strategies by educating people about ways to avoid exposure. Across the developing world millions of people are moving to cities, where they are exposed daily to dangerous levels of air pollution. According to the World Health Organization, 98 percent of cities in low- and middle-income countries fail to meet the agency’s guidelines for air quality, compared to 56 percent in high-income countries. On a bad day in New Delhi hourly PM levels may spike as high 350 micrograms per cubic meter of air, compared to highs of roughly 20 micrograms per cubic meter on a polluted day in Houston. For this study we compared six types of face masks made from materials including cloth, paper and polypropylene. To measure how well they protected wearers, we attached each mask to a foam head which was housed in a sealed chamber. Then we flooded the chamber with PM and measured the difference between the concentration in the chamber and the levels that passed through each mask. We were especially curious about the inexpensive cloth face masks that are widely used throughout the developing world. These are simply pieces of stretchy fabric, worn over the mouth and nose and held in place by fabric ear loops. They can be purchased for less than US$1, and washed and reused many times, so they are affordable for low-income city dwellers. In our tests the masks worn most commonly in developing countries performed quite poorly, removing only 15 to 57 percent of particulate matter from the air that passed through them. On a polluted day in New Delhi, this means that as much as 85 percent of PM can pass through a mask and reach a wearer’s lung – roughly 300 micrograms per cubic meter of PM, tenfold higher than WHO standards for ambient particulate matter. For comparison we tested N95-certified face masks, which are made of polypropylene, a non-woven synthetic fabric. When these masks are tested under controlled laboratory conditions, using particles made of sodium chloride that measure 300 nanometers in diameter, they remove 95 percent of the particles. These standards were devised to provide adequate protection to workers who temporarily have to endure extreme exposures while performing jobs such as mining, machining, and other hazardous occupations. Other masks, including cloth and cellulose versions with pleats, performed almost as well as N95 masks. However, none of the masks we tested – including N95 masks – was especially effective at filtering a mixture of air and diesel exhaust, which city residents might encounter on a busy street anywhere in the world. Although we focused on PM, it is important to note that air pollution exposure involves a wide mixture of different chemicals, many different sources, and microscopic particles of many different sizes that can actually change in size over time. In general, all of the masks we tested worked moderately well for protection from the largest sized particles. The least expensive ones provided very limited protection from fine particles, and no mask provided 100 percent protection. Further, people around the world have different face shapes and sizes, and face masks can fit differently from one person to another. Under controlled settings in a workplace it is not difficult to ensure that masks are used properly, but busy city residents may not know how to adjust their masks or ensure that they fit as snugly as possible. In heavily polluted cities, particles are often much smaller than the 300- nanometer particles we used in our laboratory, especially near combustion sources like cars and trucks or open fires. The smaller particles are, the harder they are to filter. Even N95 masks are not designed with traditional urban air pollution sources in mind. This means that even if users in the developing world were to use N95 masks – which many of them cannot afford – a significant fraction of these harmful particles would still reach their lungs. Some innovators have designed better consumer cloth masks that are similar to N95 certified masks. These new designs meet N95 standards, but it is not clear how effectively they would work for a typical taxi driver in Karachi or shopkeeper in Saigon. For much of the developing world these products are unaffordable, so most residents in polluted cities are likely to continue using inexpensive cloth masks, which we now know do not protect us as much as we hoped. Is it possible to design an affordable mask that provides better protection? Probably. But until that happens, we cannot allow users of these masks to assume they are completely protected from air pollution. A number of these masks provide at least some protection, which is better than nothing. But people should also moderate their exposure by making choices such as whether to smoke, where to live, and whether to travel along traffic-clogged streets, while we work over the longer term to reduce air pollution at the source.